The Vice Chancellor of UKM has agreed to appoint Associate Professor Dr. Neoh Hui Min as the new Deputy Director (Research, Innovation and Networking) of UMBI for a period of 3 years from the 15th of February 2017. We at UMBI would like to congratulate her for this appointment which is certainly a milestone in her career. Dr. Hui Min joined us 8 years ago having completed her PhD at the Juntendo University in Japan. We are confident that Dr. Hui Min will be able to contribute further to UMBI from this important leadership position. She is an outstanding researcher who is not only passionate about science but pays a lot of attention in guiding the junior staff members and also students. Her niche area for research in microbiology and her research is focused on the multi-drug resistant Staphylococcus aureus, dengue, Chikungunya virus and Zika virus plus also microgravity science using Caenorhabditis elegans as a model. To date, she has a total of 30 publications, 1097 citations and an H-index of 13 (Scopus). 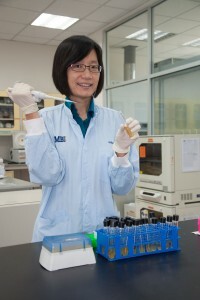 We congratulate Dr. Neoh and wish her all the best for the future in the new position.